This is a continuation of a Travel Series of my vacation to Myrtle Beach. To start at the beginning go HERE. The rest of the posts,, in chronological order are HERE, HERE , HERE and HERE. On our last day in Myrtle Beach before we headed to Charleston the next day we spent the morning on the Myrtle Beach Boardwalk and the afternoon at "Broadway On The Beach". To keep the post from becoming too long, I'll share just about our visit to the boardwalk in this week's post and cover "Broadway On The Beach" in next week's travel post. 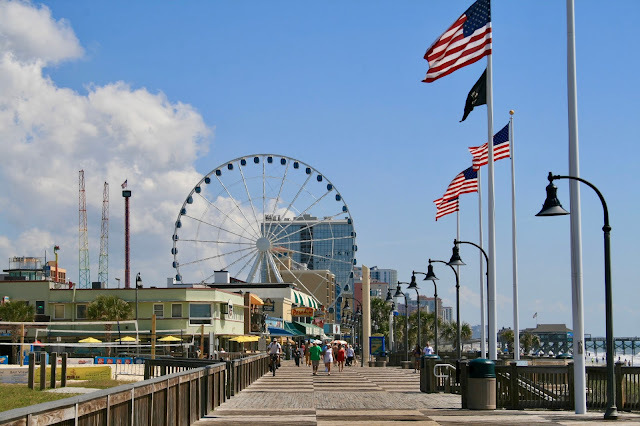 Our hotel was located 2.2 miles from the start of the boardwalk, so we drove to the boardwalk and paid $5.00 to park for the day. I'm sure parking is a lot more expensive and harder to find now than it was during the off season. 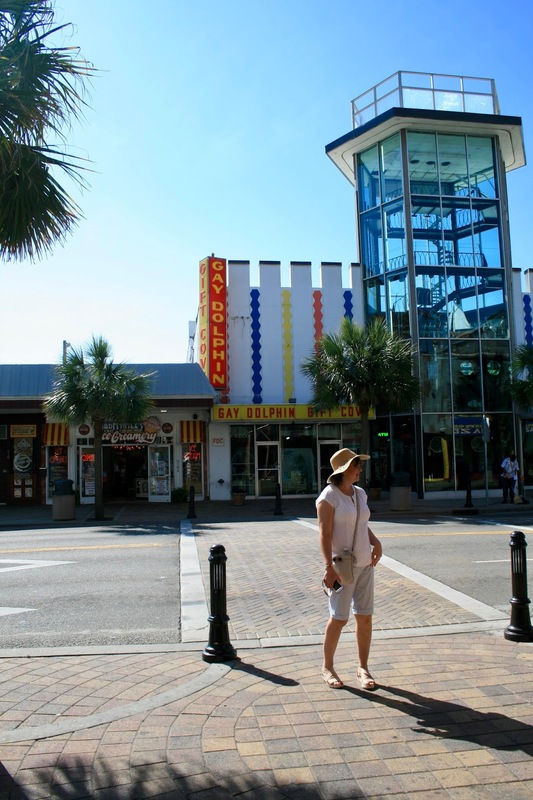 Right on Ocean Blvd, the first street off the boardwalk, is a very touristy area filled with various attractions, gift shops, and restaurants. We didn't go to any of the attractions, but we enjoyed looking at all the interesting and colorful buildings. 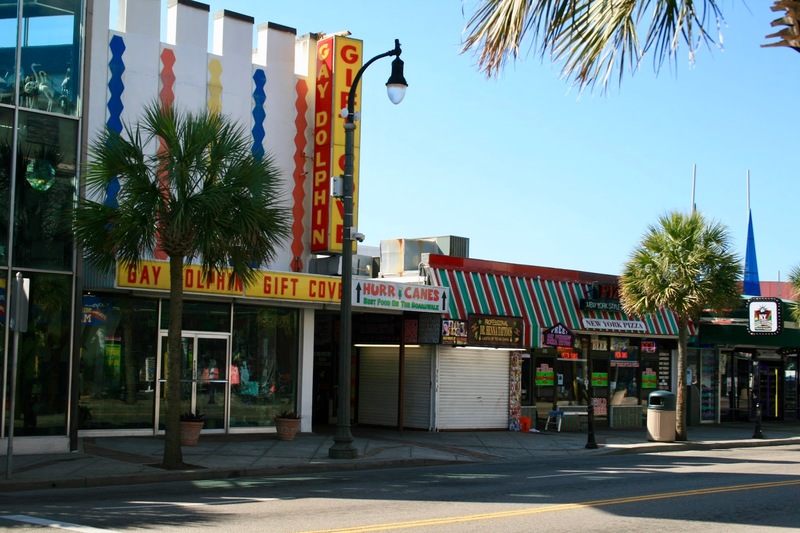 Here I am looking down Ocean Blvd., to see if there is anything I'm really interested in checking out. We did go into the Gay Dolphin Gift Cove that you see behind me. It's a huge three story store with so much inside it was easy to get lost inside. We purchased some inexpensive scarves and I had a coupon for a free magnet so we grabbed one of those too! Ya'll know I love my coupons! On this street they also had a old fashioned arcade. 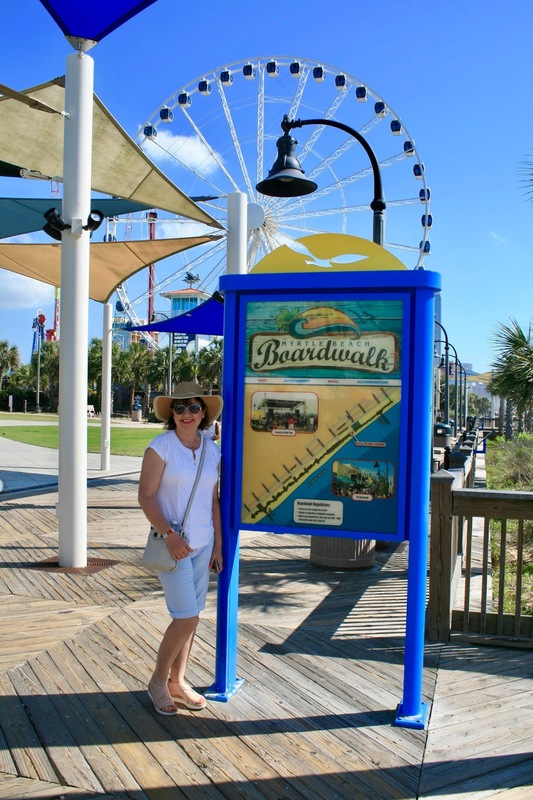 Once we finished exploring Ocean Blvd., we headed over to the boardwalk. It's kinda hard to miss, because of the gigantic Ferris wheel! We arrived around 10:00 a.m. before it got crowded. It was nice to see during the day to enjoy the sun and ocean views, but I'm sure it's very pretty at night too when it's all lit up. 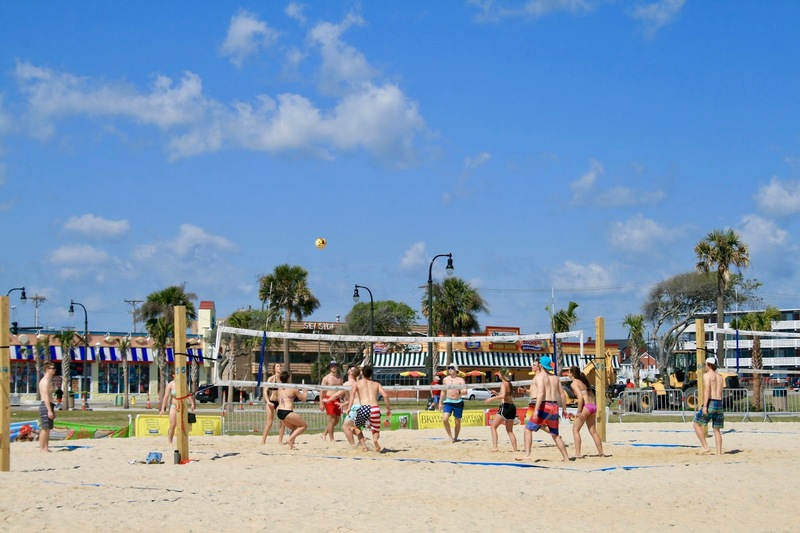 Even at 10:00 in the morning, there were kids playing volleyball! 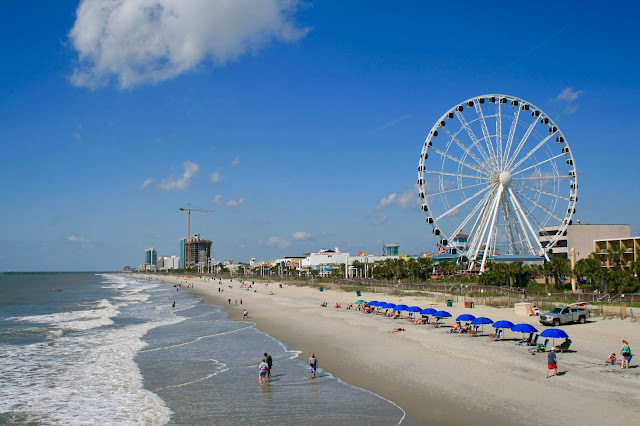 I read some negative reviews prior to leaving for my trip about Myrtle Beach being rundown or too touristy. I didn't find it rundown at all. I thought it was quite lovely and well kept. As for being touristy, my answer to that is most beach towns are touristy. If you want natural, pristine beaches, you need to go to a state or national seashore (like Cape Canaveral or Huntington Beach State Park) or a private beach. 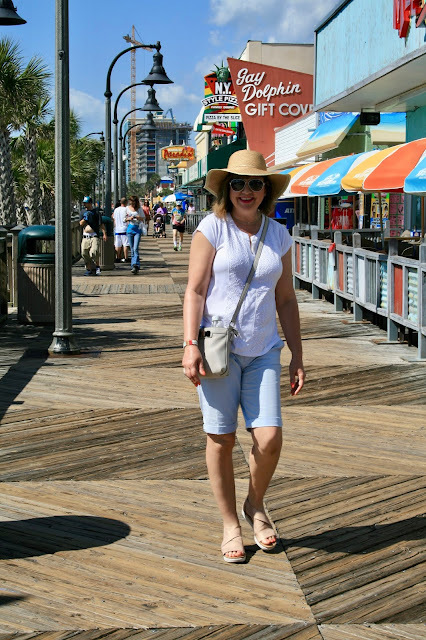 The boardwalk is made of wood, it does turn into a concrete path at the start of the boardwalk around 7th Avenue. There looked like there were plenty of great places to eat, but we didn't have any food so I can't recommend any restaurants. We had a huge breakfast at are hotel and only stayed at the boardwalk a couple of hours. The pier cost $1.00 per person to walk on or fish from. There is also a restaurant attached to the pier, and if you eat or drink there you can walk the pier for free. My husband really wanted to walk to the end of the pier, so we paid the $1.00. It was worth it, for we got some great pictures! This picture was taken from the pier looking back at the shore line. And this picture was taken from the pier looking in the opposite direction. 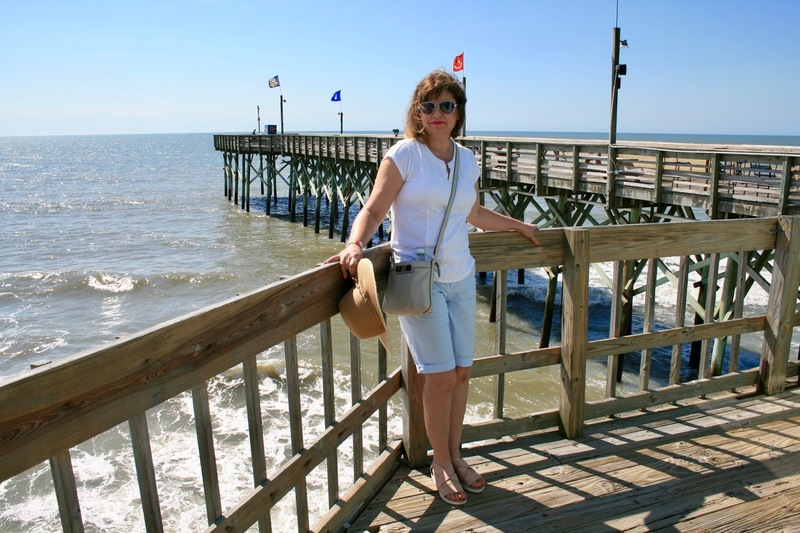 And here is a picture standing at the end of the pier looking directly back to the beginning of the pier. The blue building is the restaurant/gift shop. 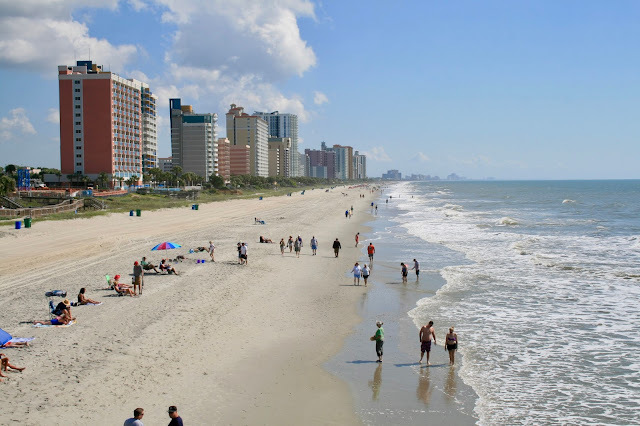 We didn't do anything at Myrtle Beach other than walk the length of it and enjoy the views. It is a very pretty and lovely walk. 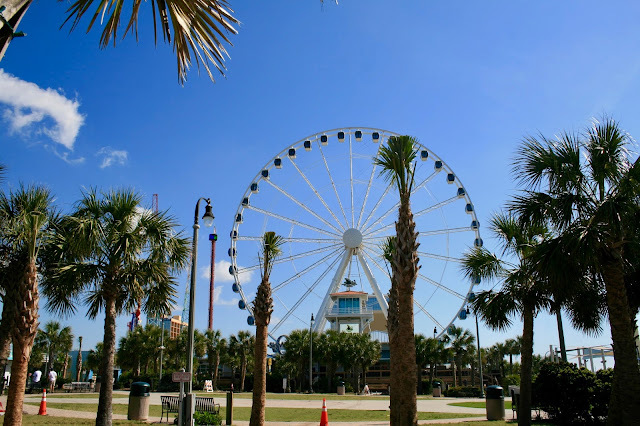 If you don't mind spending money (we are always on a travel budget) there were a lot of activities to do there like the Ferris wheel and all the Ripley attractions. We were just happy to walk, and enjoy the ocean views and the fun beachy architecture surrounding the shoreline. 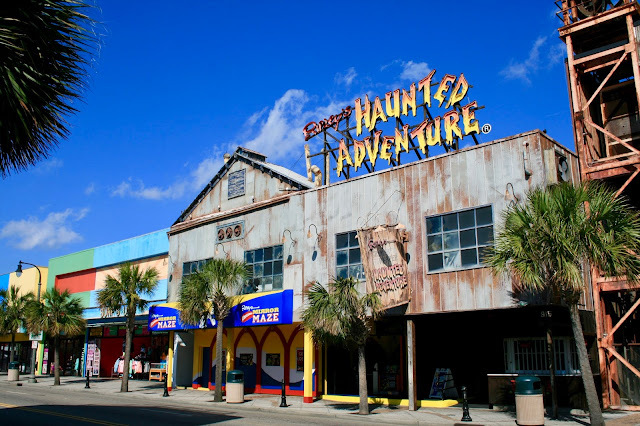 When we finished exploring the boardwalk, we popped back in our car and headed to Broadway On The Beach....but I'll tell you more about that place next week! so many fun things at Myrtle Beach! definitely on my list of places to check out now! Thanks Kileen...you will love it there! 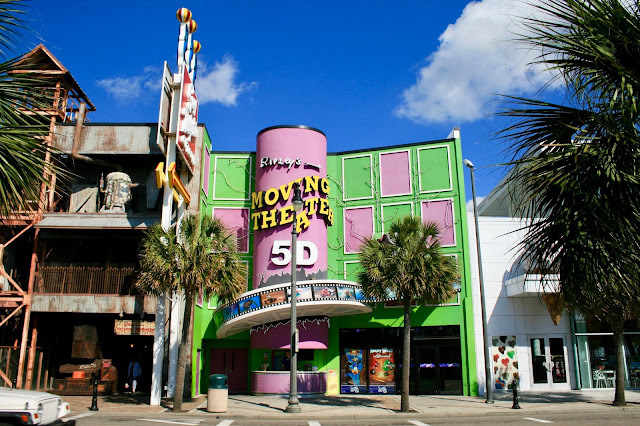 We just visited Myrtle Beach and had so much fun in that arcade! I loved that all of the games were a quarter! I had no idea the games were only a quarter because we never went inside! I would have played a few games had I known that! Thanks Elli! I hope you have a great time. If your only going to do one thing, the Ferris Wheel is the best thing. I'm sure you'll get some great views. Wow---that's a little amazing that they charge to walk the pier---but I guess it makes sense since they need to upkeep it!! And you're right--the photos were great! I have a quick question, Amy! I love reading your blog and I'd love to get an email to know when your new posts come out. Do you have that---am I missing it?? Jodie I've been to a lot of oceanside beaches and they all have a small cost to walk on them unless they are a government owned pier. As for email notifications, the blog template I use with Blogger doesn't allow that service. If you go to my contact/follow page you will see all the other ways to follow. Google + and Bloglovin both share my new posts. So does Twitter. And every time I write a new post, I also share it on Instagram. 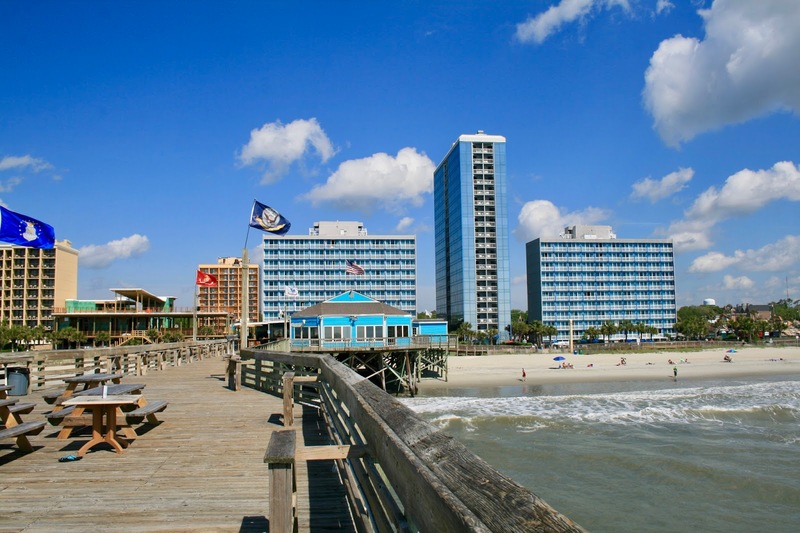 We vacation at Myrtle Beach every year and have since I was young. I love it and even if it is "touristy", I would take that over a deserted beach any day! We love Broadway at the Beach! 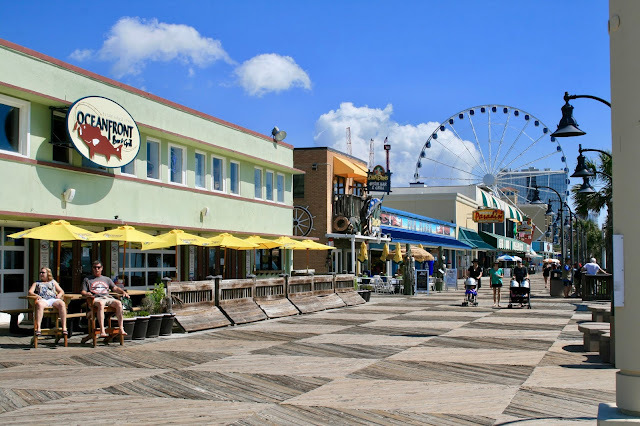 It has unique shopping and we always have to grab a bite at Margaritaville! I hear this a lot from people. It seems visiting Myrtle Beach is a tradition for a lot of people or they have really good childhood memories of it. As for Broadway on the Beach, we loved that more than the Boardwalk! It was so fun! What a fun area! 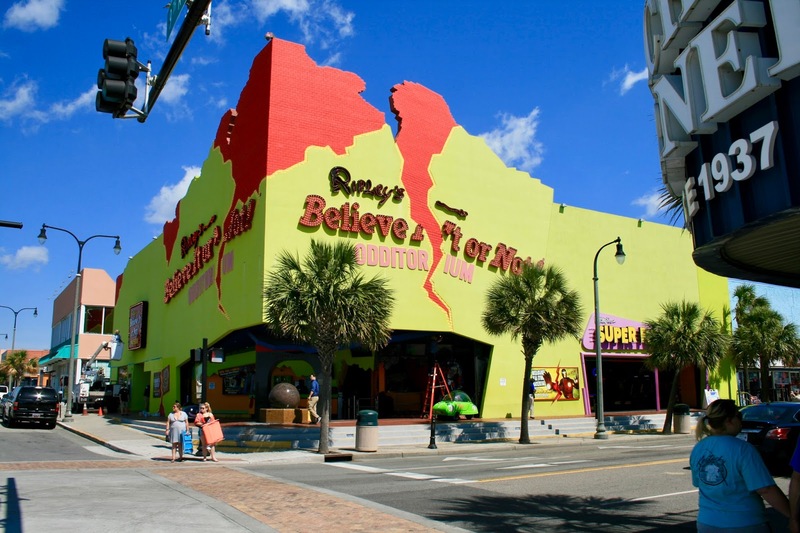 We have a Ripley's Believe it or Not in Branson, MO... I love that they have an old fashioned arcade, my kids would love that! Thanks Carrie! It is a fun area, something for everyone!